Be the one that shows up with the "best of trip" treat. Moister, chewier, more delicious and easier to make than any brownie mix you've ever found. This recipe took me months to perfect. I think I used up five pounds of chocolate getting it just right. Campers tell me this is their favorite social dessert. Be the one that shows up with the "best of trip" treat. 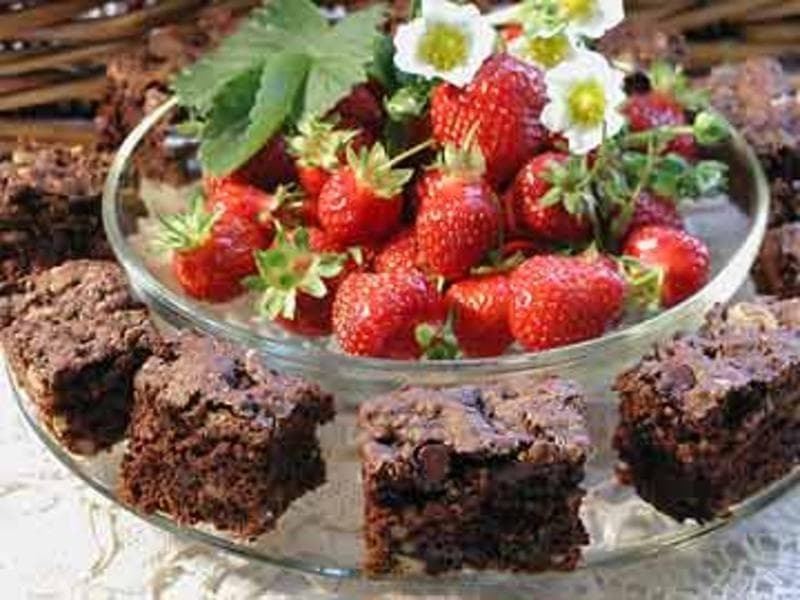 If it's been a while since you've experienced the perfect dessert, then sit down to some brownies and a glass of milk. You can use my stovetop skillet-bake instructions, my oven-bake instructions or make a BakeOver crust. Organic Unbleached Wheat Flour, Organic Dark Semi-Sweet Chocolate Chips (organic sugar, organic chocolate liquor, organic cocoa butter, soy lecithin, organic vanilla), Organic Cane Crystals, Organic Walnuts, Organic Non-Alkaline Cocoa, Barron Flour Mill Baking Powder (aluminum/gluten-free, made w/non-GMO organic rice starch), Baking Soda, and Sea Salt.